One of the most emotional moments of any wedding ceremony is when the bride walks down the aisle to the sound of the traditional ‘Bridal Chorus’. Many couples however, prefer to pick an alternative piece of music to mark this special event, usually something more personal and meaningful to them. Here are some ideas about music to walk down the aisle to. Check the piece of music you play is long enough. You will feel a bit embarrassed if the music ends and your maid of honour and you end up walking down the aisle in silence. You’ll need enough music for your bridesmaids, flower girls, and page boys to get down the aisle as well as yourself. 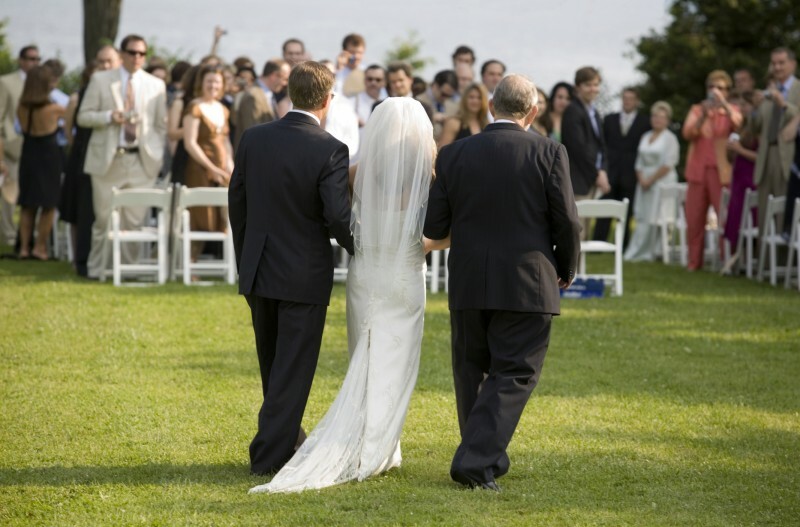 Run your choice of processional music past your venue and registrar or minister as there may be certain guidelines concerning the type of music you can play. Check beforehand to avoid offending anyone, especially if you are getting married in church or you have chosen a particularly uncommon piece of music. On the day it will feel as though you are moving at snail’s pace, so practise walking to your chosen music prior to the wedding so you get used to walking at the right speed. You want to grab your guests’ attention to ensure you are the centre of attention as you make your big entrance so choose aisle music that will be dramatic. The prelude music should be subtle and unobtrusive, but the volume should increase when the bridal party arrives. Make someone responsible for turning up the music for the processional and the change in volume will announce the beginning of the ceremony. Select a piece of music with a short interlude that can be played just before the doors open and you make your entrance. This helps to develop drama and excitement, and let’s guests know you are on your way so they can get their tissues ready or position their cameras! Choosing a song that is poignant and meaningful to you is one way to make your wedding ceremony unique and special, and you aren’t restricted to having traditional music to accompany you down the aisle. Some favourite tunes include ‘Fairytale’ by Enya, ‘Hasta Mi Final’ by Il Divo, ‘Beautiful’ by Christina Aguilera, or ‘Pretty Donna’ by Collective Soul. If you are getting married in church, you may want a hymn or religious piece of music for your trip down the aisle. You could choose from ‘St. Anthony’s chorale’, Dona nobispacem’, ‘All people that on earth do dwell’, or ‘Hanavababanot’. Some classical options for music to walk down the aisle to include ‘Procession of Joy’ by Hal Hopson, ‘Trumpet tune’ by Henry Purcell, ‘Wedding march’ by Mozart, ‘Romeo and Juliet love theme’ by Tchaikovsky, ‘Sinfonia’ by Bach, or ‘Winter’ from the ‘Four seasons’ by Vivaldi. For a really beautiful entrance, nothing beats traditional classical pieces.